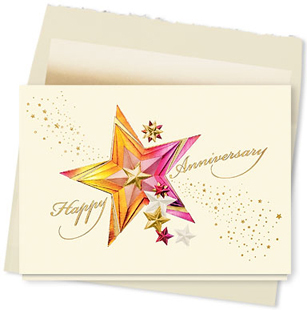 I love the joy of design #340AY, Sparkling Stars Anniversary Card. Anniversaries mean so much to people. Of course we all think of wedding anniversaries, but there are many business anniversaries to be celebrated as well. The absolute happiness that this embossed star exudes is intensified by the beautiful rose hued gold foil with overtones of bronze. The liberally sprinkled “star dust” adds a delicacy that offsets the bold and brilliant star. Business anniversary cards can serve a few purposes. You can honor individuals for their loyal service or you can announce the fact that you have been in business for so many years. Either way you are able to remind workers, or customers, and to announce to prospects that you have been here for them and are always ready to fulfill needs. This card is an eye-catcher. The person who receives it – a customer, worker, vendor or friend – will appreciate your thoughtful gesture.